My life-long but usually dormant interest in coniferous trees was suddenly rekindled by a chance visit to Sequoia National Park in early 2002, where I was again awed by the giant sequoias which I had last seen as a child over two decades earlier. Within weeks of this trip, I was reading every book I could find about conifers, both the spectacular forest giants themselves and their numerous unusual dwarf cultivars which have been developed by horticulturists over the past few centuries. 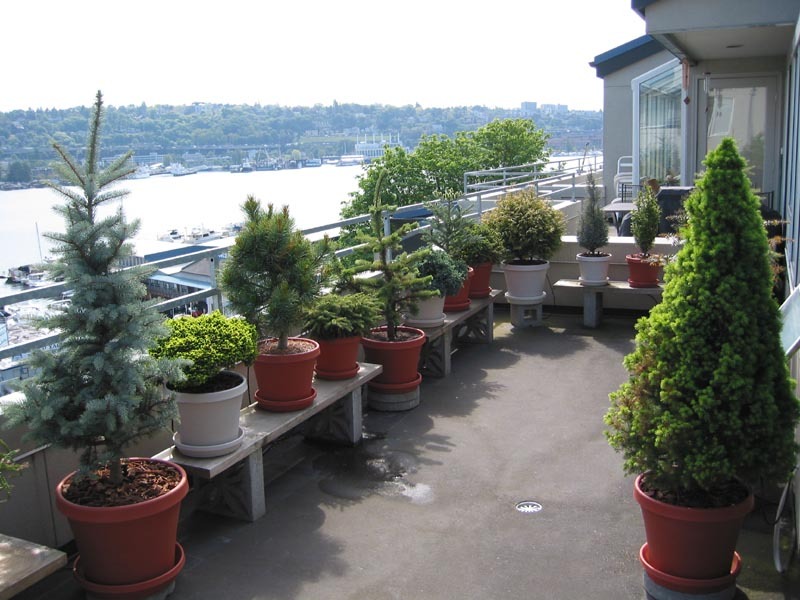 Soon I had acquired a veritable forest of container-grown dwarf conifers, seen here on my deck above Lake Union in Seattle. 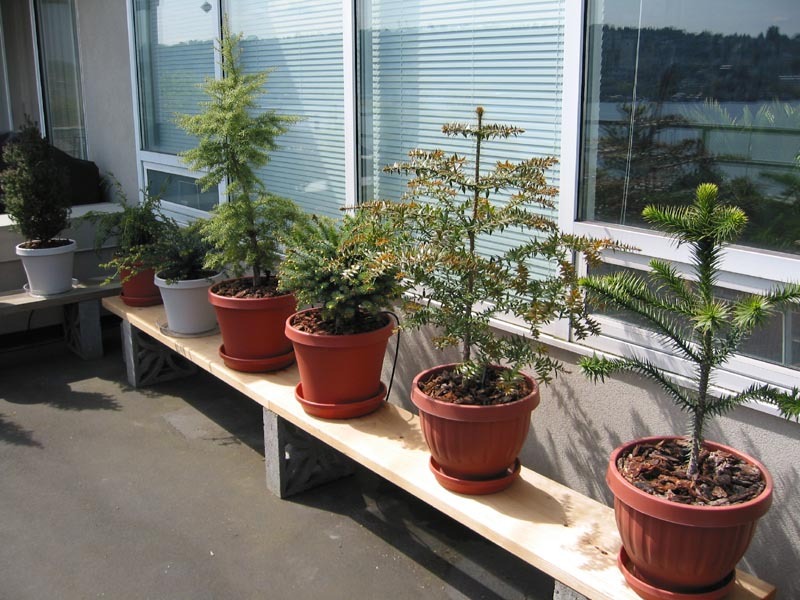 Most conifer species form large trees in the wild, but these dwarf cultivars and slow-growing species can easily be grown in pots. They require almost no maintenance compared with typical finicky deciduous trees and plants. No hard pruning is required to maintain their compact size, since typical growth rates for these trees are only a few inches per year (and even less than an inch per year for some of them). 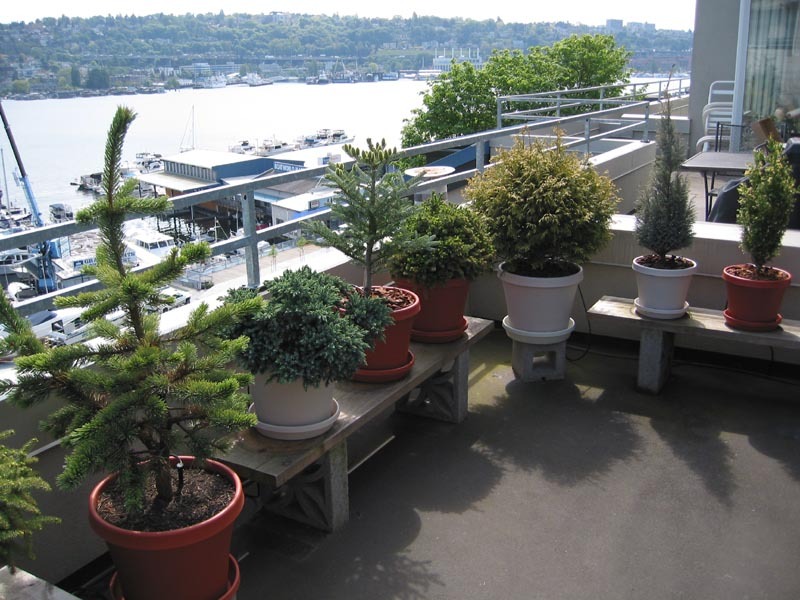 Most of these trees are quite drought-tolerant, and in Seattle's moist maritime climate they easily survive much of the year with no supplemental water, although regular watering is still needed during the hot and dry summer weeks. To avoid this chore, I have installed a cheap and simple automatic drip-irrigation system going to each pot (the tubing and heads for this system are visible in the photos). As you can see from the photos below, cultivated conifers are available in a wide variety of foliage colors, including blue, golden, silver, and even reddish-purple in addition to numerous shades of the more-typical green. See my page about Conifers of the Cascade Range for more about conifers in their native environment. 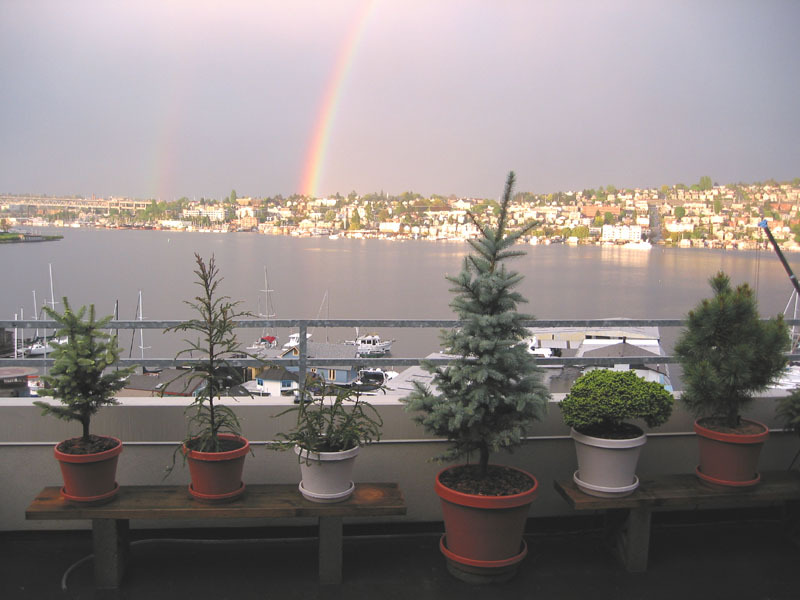 A spectacular double rainbow rises above Lake Union beyond my deck (all photos from 2003). Interested in learning more about conifers in their native environment? See my page about Conifers of the Cascade Range.